Quality and Certification in Nickel Alloys by JLC Electromet Pvt. Ltd.
AT JLC, the quality of our products forms the basis for success of our company and our customers. Meeting of quality requirements through constant improvement of procedures, processes and operating steps is one of the personal objective of all team members. JLC has adopted a Quality Management System and is certified in accordance with the standards DIN EN ISO 9001:2015. To exceed customer expectations and ensure that the product supplied meets their requirement or its intended application. Continuous improvement of product/process/system through establishment and review of Quality Objectives. Empowerment at all levels and to create awareness of the business scenario to all employees for better synergy. Adherence to all applicable statutory and regulatory requirements. JLC has put in practice a stringent Quality Management System. Besides process control, quality plans are used for testing at incoming raw materials & process consumables, in-process goods and finished materials. Systematic planning, monitoring, and control of organizational and technical processes is achieved through the application of these quality management systems. All critical process parameters are controlled using Statistical Process Control tools and all processes are set using a Failure Mode Effect Analysis (FMEA) to ensure high quality of products. A list of industry standard certifications and registrations achieved by JLC Electromet are presented below. Please click on the relevant certification or registration to view the actual certificate of the same. 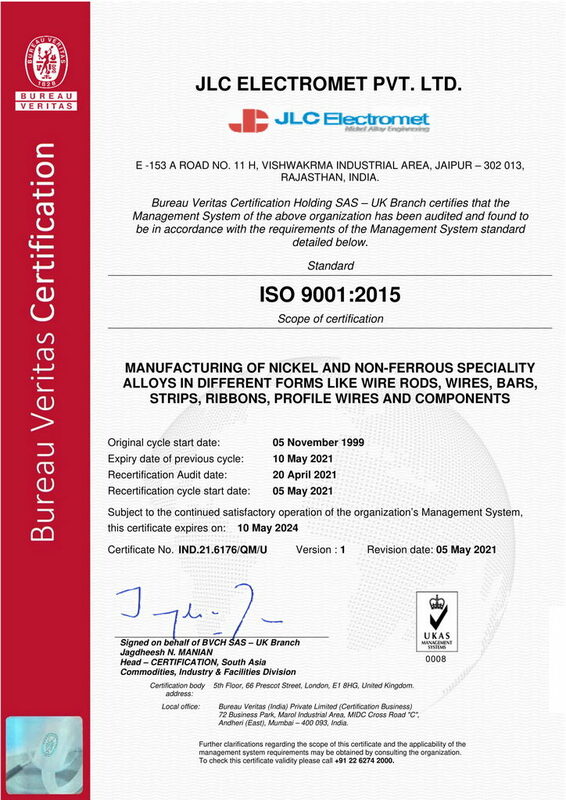 ISO 9001:2015 Certification by Bureau Veritas for the manufacturing of nickel-based alloys and speciality non-ferrous and ferrous alloys in different form. We declare that the material does not contain any restricted substance in excess of defined maximum concentration values as per the Directive 2011/65/EU (RoHS Directive). 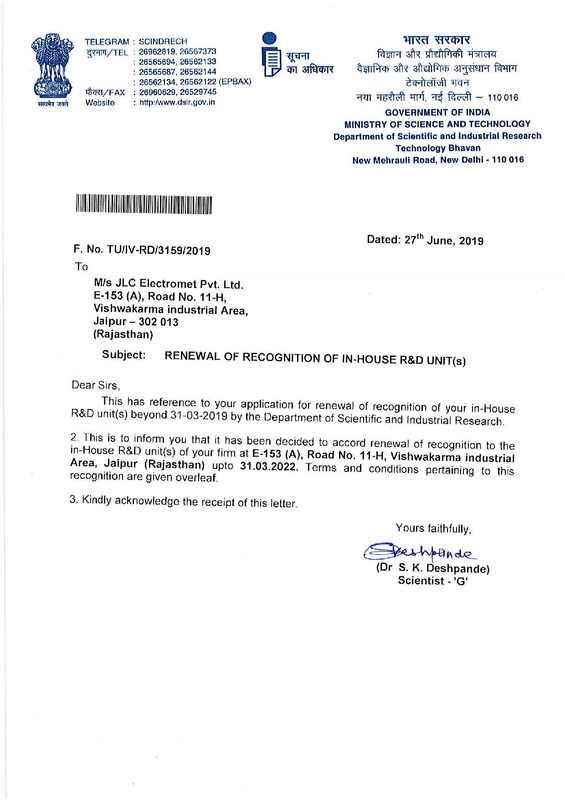 Certificate Issued by the Department of Scientific and industrial Research, Ministry of Science and Technology, Government of India for Recognition of in-house Research & Development Unit.